SHARETT, Moshe. (1894-1965). Second Prime Minister of Israel. Created Israel's Foreign Service. One of Ben Gurion's most intimate associates. 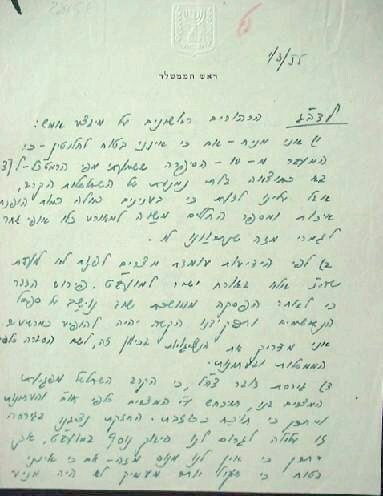 One of the last 25 signers of the Israeli Scroll of Independence at the May 14th ceremony. 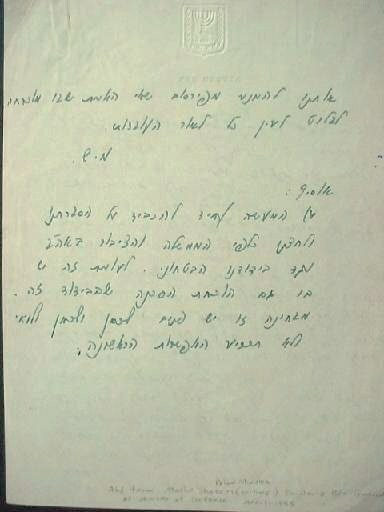 After Sharett signed his name on the Scroll, Ben-Gurion spoke up: "The State of Israel is established...!" "First critical comments on yesterdays operation: 1) I imagine although I am not definitely certain that the number 10 which I heard from the Chief of Staff, was a result of extenuating circumstances in the midst of battle. But we must be made aware of, that in such cases the number translates in quality, and the number of casualties makes sense in light of what happened, but may not be what was originally planned. 2) From information received, Egypt will not turn to the (?) committee but will apply directly to the Security Council. This means that after a lengthy stoppage, we will once again be put on trial and our difficult task will be to appear as the underdogs. I am instructing all embassies in this direction in order to explain to the various governments. 3) The Israel Defense Forces explanation that the battle raged because of Egypt's attack on us, will be denied by the Egyptians towards the United Nations and the media. And it is possible that this will be proven wrong. Our Ambassador's insistence on this explanation may cause us additional difficulty in the Security Council, although we may not be able to avoid it even though I'm not sure that taking this under greater consideration would not have prevented us from avoiding the truth."